You CAN regain your muscle strength – but you have to work hard to get them back! “It’s a massive physical challenge” to have a baby, says Jessica McKinney, director of the Center for Pelvic and Women’s Health at Marathon Physical Therapy and Sports Medicine based in Boston. Abdominal muscles lengthen significantly during pregnancy, the spine moves into an exaggerated S curve, caesarean section can leave internal scar tissue, and the hammock of muscles in the pelvis that support organs and bones, called the pelvic floor, stretches or even tears, she says. Left untreated, the changes can cause problems down the road, from pelvic and low back pain to incontinence and other issues. Courtney Freck, an avid runner who lives in Sterling, Va., started having sharp hip and back pain while running about a year after the c-section birth of her second daughter. Doctors weren’t sure what was wrong. Eventually, she consulted a women’s health physical therapist who pointed to her weak core muscles and her lingering diastasis recti, or the separation of her “six-pack” muscles. The separation occurs in almost all pregnancies and often doesn’t resolve on its own. “I just thought it was one of those things, you have a baby and things never go back,” says the 36-year-old purchasing manager for a health-care company. She did exercises to strengthen her interior abdominal muscles and pelvic floor. She is now training for a marathon, running about 25 miles a week. 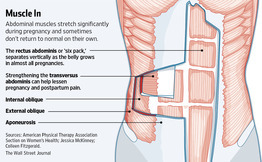 To reduce diastasis recti during pregnancy, physical therapists recommend avoiding sit-up movements that rely on the external abdominal muscles. Instead, they suggest women get out of bed by lying on their sides and pushing themselves up with their arms. With a new baby to care for, women often ignore seemingly small things like pain, says Ms. McKinney of Marathon Physical Therapy. Patients think “I have to throw myself at the altar of motherhood,” and it’s normal that my body doesn’t work as well, she says.